Several months ago I wrote a post for International Women’s Day, Appreciating the Needlework of Our Grandmothers, in which I described how I sorted, then displayed, my Grandmother’s needlework and quilts. Her fabric art had been left in an attic trunk; with renewed appreciation, I researched different pieces in the collection. 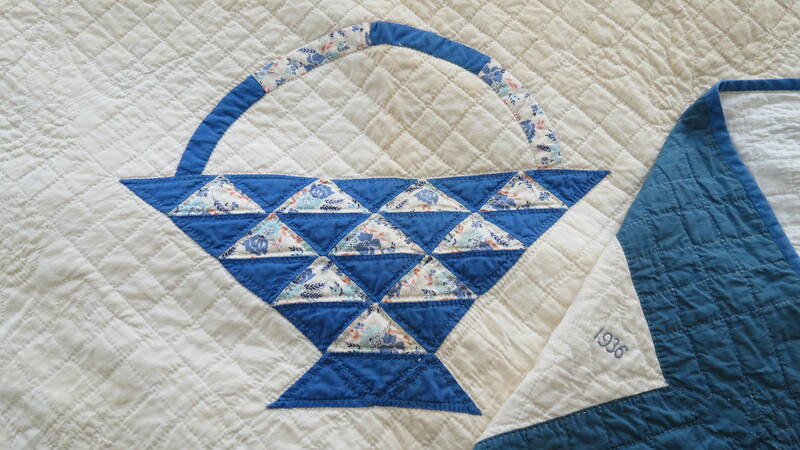 In this post, I’ve included several more photographs of my Grandmother’s quilts and added history on the subject. 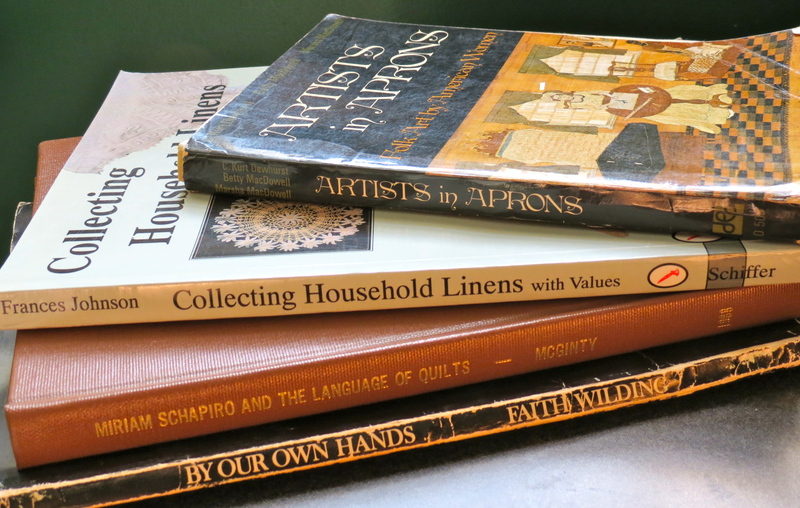 My friend, Kay McGinty, lent me several books on quilts and needlework. 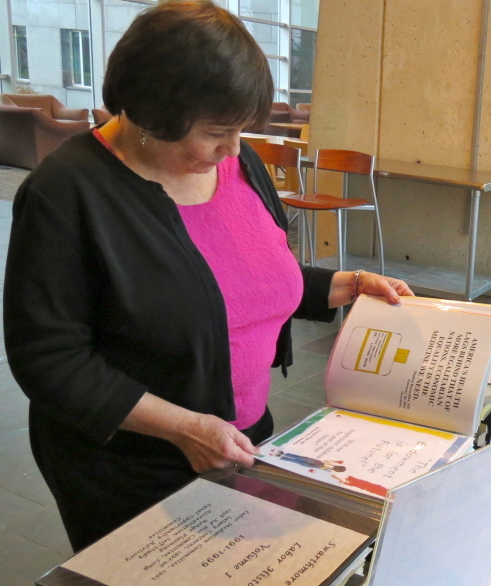 For her graduate work, Kay completed a thesis entitled, “Miriam Schapiro and the Language of Quilts,” which offered an informative study of Shapiro’s artistic creations. Schapiro, a leader in the feminist art movement, used elements of quilting in her creations and brought quilting into the “realm of high art.” Using the quilt as a model, Schapiro incorporated quilting patterns and designs into her collages. The early 1970s saw a flowering of popularity for quilting as art historians began to appreciate quilts as art. Also contributing to the interest, artists began to focus on American crafts, and the feminist movement brought attention to the culture of women’s lives. 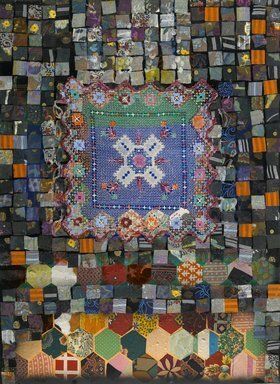 Artists began to use elements from the heritage of quilt art that women had been practicing for over two hundred years. Years ago, my father-in-law asked if I would like to have the sewing machine that belonged to his wife. The veneer top had been terribly warped; I was taking a woodworking course at the time and decided to rebuilt the top on the treadle foot cabinet. Although women mostly quilted by hand, the sewing machine could also be used. 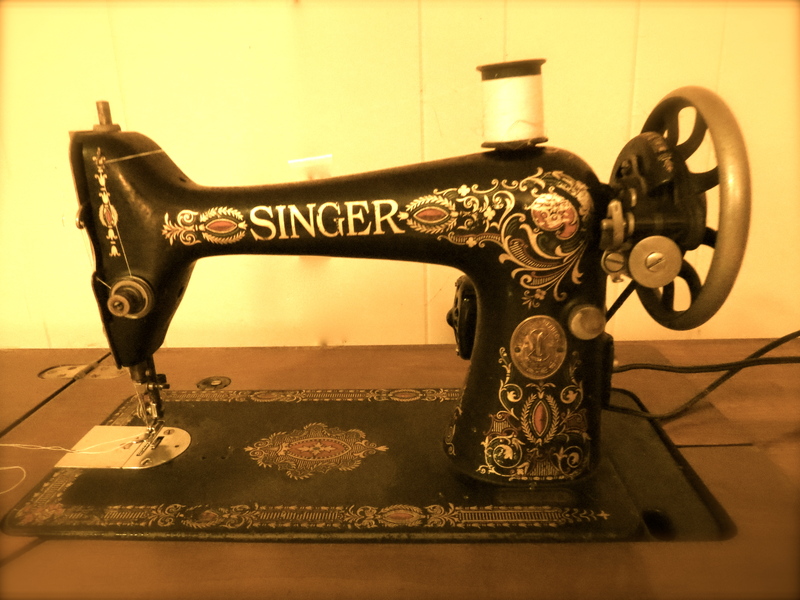 This machine, over a hundred years old, can still handle most heavy-duty sewing. Internet sites include those that support human-powered sewing machines; this page displays treadle and vintage sewing machines. A uniquely American institution, the quilting bee provided the opportunity for women to work collaboratively on the last steps of quilting, the completion of the top of the quilt. The time spent during a bee became an opportunity to share news, discuss politics and learn new skills. Susan B. Anthony spoke at a quilting bee in her first speech advocating for the right to vote. 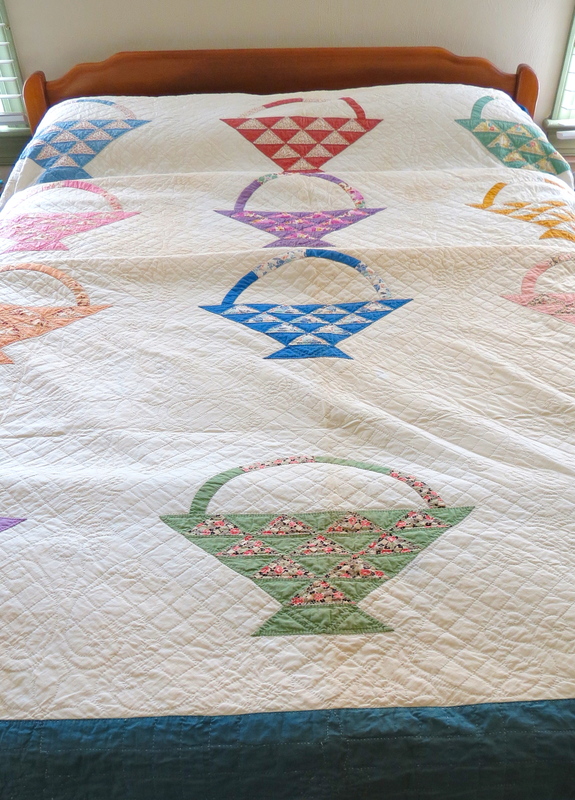 My Grandmother created this basket quilt in 1936; the basket pattern was popular in the Depression Era. Reflecting the romanticism of the Colonial Revival, baskets were symbolic of the Colonial period. My Grandmother used bright pastels and a geometric print on this next quilt, representative of another popular pattern during the Depression. 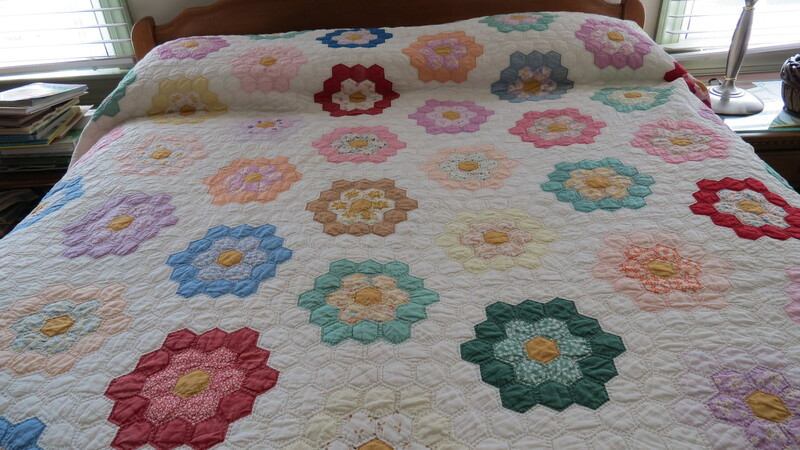 Done by hand, this is a particularly labor-intensive pattern referred to as Grandmother’s Flower Garden. In paging through the book, Artists in Aprons, I came across a photograph of quilters in Detroit, Michigan. My Grandmother lived in Royal Oak, just outside of Detroit, where in 1938 over 18,000 women attended a quilt show at Wayne State University. Today quilting is a $3.6 billion industry. The debate continues on what is art and what is craft–what seem to be arbitrary designations. A quilt made for exhibition falls into the category of art while authorities designate a quilt made for a bed as craft. Art created for the home or for function cannot be peeled from the realm of artistic creation. To do so would be to discredit the art women create, many times in extreme hardship or because of limited artistic opportunities. Gathering little pieces of cloth, sometimes from rags, women found a way to express artistic form in quilting and to make that art part of their home. I never knew my Grandmother, but I can feel her creative presence in her quilts.